I deleted a few hundreds photos from my Shoebox, but now none of my photos are accessible. The timeline is blank. I can tap on Month and see the timeline, but if I tap on anything—or if I go back to Year—all the photos disappear. Under Settings it shows that I have 0 photos and 0 albums. I should have about 800 photos. I downloaded the Mac OS desktop app and it won’t load. It just gets stuck in Uploading Photos. Love love love this app! It’s getting easier to navigate, which I really appreciate. But my absolute favorite thing about this app (besides unlimited storage for pics) is that when I download a pic back onto my phone it still has great quality. 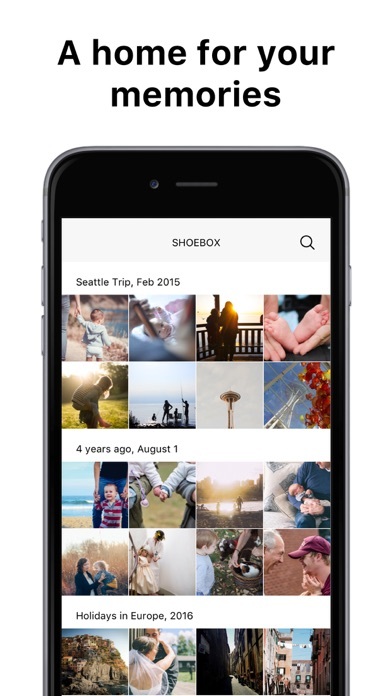 Google photos doesn’t have as great of quality for unlimited storage of pics but shoebox does. I’ve printed them out too and they’re great. I love this app and would be devastated if anything ever happened to it!! Thanks for such a great product! I’ve had this for about 5 years it’s has all my photos and videos I love this app so much !! Used to be great. Lately it’s been a nightmare. Won’t let me access older pictures. I can see the thumbnail of the older pics are still in the year and month tab but when I click on thumbnail pictures it goes back to timeline and the pictures are all gone except the last few months. I’ve had shoebox a year and a half syncing photos. So that’s thousands of photos gone. I honestly didn't think I was going to use this app as much as I do. It gives me something to look forward to on a daily basis. Great app. This app is so great that it will put all pictures in to save. I will put on an older computer to get those pictures to have also! Very easy to use just love it! Doesn’t load all the pictures saved even if connected to WiFi!!! Been using this app for over a year now and it’s exactly what I needed. I am paranoid that I will lose my photos and I’m not great about backing up my phone. All of my pictures are backed up automatically in case I don’t have a chance to download them and something happens to my phone. Such a great relief. I also like the daily email with photos from the same day of past years. Fun to look back for a second during the day and keep things in perspective! I COULDN’T DOWNLOAD ANYTHING ON MY OLD PHONE....BUT SHOEBOX SAVED ALL MY PHOTOS. SO GRATEFUL!!! 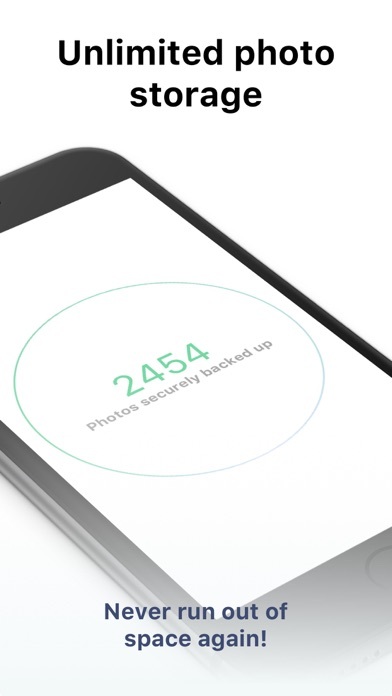 I’ve searched, and searched, and so far this seems to be the only photo backup app which respects your privacy. Having said that, I would give this app a 5 if I could just make minor edits in the app or on my pc, such as rotating a photo without it being a big deal. After downloading this app I put all my pictures on it and started deleting pictures from my camera thinking they would all say I ended up deleting half of my pictures that did not save to this app my experience was bad. It’s great. The problem is when you are off line which happens. Mountains, foreign country cannons. Not only saves your pictures but keeps them by date! It’s good, but there’s two problems. This app is great, and it shows and keeps all your pictures, but there is two problems. One is that when scrolling through pictures, there is duplicates of the same photos, when there is originally is supposed to be one. Also, it doesn’t keep videos, and if it did, it would be way more helpful. But, this is a good app and I do recommend this app for picture storage. Shoebox app deserves way more than 5 stars!!!! I have had the Shoebox app for a few years now and I deleted it not long after downloading it because I had a false assumption before I even really tried it out that it just sounded way too good to be true. I started running low on space on my devices and redownloaded the app and discovered how wrong my assumption was that the app was just too good to possibly be true. Not only was it the most handy, neat, storage saving, etc etc app I have ever had that benefits me in more ways than I can count and is completely FREE!!!! I could literally go on and on about how awesome Shoebox is but I would run out of room to keep typing! I more than highly recommend downloading the app and trying it out for yourself! You have absolutely nothing to lose and everything to gain from trying it out!! I can guarantee you that you will not be the least bit disappointed! This app has more than exceeded my expectations and saved thousands of irriplacable photos and videos that I would of lost on several occasions had I not had the app installed! I absolutely cannot thank the makers of the application enough for their hard work and dedication to keeping the app amazing and storing the memories of my life! I have to also brag about the emails they senfbof daily memories that I normally would have forgotten about! Love that feature! They don't bombard your email inbox with useless and annoying emails constantly irritating me but they send daily photo memories and I love that feature as well!! In my opinion, anyone who doesn't have the app is really missing out on a wonderful addition to your devices and using your storage space for unnecessary reasons when it can easily be freed up by having this app and not only that, everything saved us backed up immediately by itself and stored to the application without you having to do anything! It is all done automatically with no effort from you at all. Also, everything is organized by dates!!! Just try it at least! Guarantee you will be mad at yourself for not getting the Shoebox app sooner! THANK YOU ALL AT SHOEBOX FOR THIS WONDERFUL APP AND ALL OF YOUR EFFORTS TO CONTINUE PROGRESSING IT TO BE EVEN BETTER ALL THE TIME!! You are very appreciatied!!!!!! Love this app fav app I have for real have 10 thousand pics. I don’t download many apps but this one caught my attention. Once I got into it I realized just how great it is. So simple but effective and useful. I absolutely love it. You have to have this if you are like me and a die hard photo collector. Can’t say enough about how great this app is. Thanks. I e used this app for years and love it! Through all my phones I’ve never lost a photo. It’s awesome & easy to use. i’ve had this app for yeaaars and every day i go on it hoping to see the “this day in history” pictures. Seems like you guys took that off. why? I’m so glad I found this app, it’s my treasure chest of memories, accessible from any device anywhere! Every day I look forward to being reminded of wonderful past photos! Thank you! Saved all my pics when I lost my phone! This dependable product has proven to be a truly reliable software application as it has allowed me to effortlessly upload high-resolution photos/videos onto its functional platform. Needless to say, this product is effective and efficient. Shoebox has earned a 5/5 stars from this satisfied user! I love shoebox because it saves my memories ! Forgotten times are relived with this wonderful app. Pictures are clear reminders of happy days and events. Always a surprise as to what pops up! I love seeing my memories. I love the organization. I have zero complaints. It doesn’t notify me nonstop like other app. Keeps it simple like I needed. I love not having to worry if my phone breaks I still have my memories. I like that it only backs up when I have WiFi on so it doesn’t use any data. My phone was stolen and I thought I lost EVERYTHING!!! Shoebox! You totally SAVED ME!!! THANK YOU!!! Unlimited photo storage? YES!!!! This is great. I have a lot of photos and it great to have them backed up and easily accessible on my phone as well as my computer. Highly suggest it for those who like to take photos. I also love the daily emails. Sometimes they are stupid since I took a photo of French fries 6 years ago, but most of the time the memories are meaningful and I love the daily reminders. This app is really good but there are a lot of cons: -the photos and vids download really slowly -when it says that it will clear up space, they don’t show you which photos they’re going to delete - I see no difference in the cloud storage. I still have very little storage -there aren’t a lot of options for the people who has the free plan So I really hope that these will get through because I would really appreciate the update. Please!!!! I love it how it keeps all my pictures..
Great back up I love the way you can search by date place etc. Then forget info😊. This gives me another opportunity to re-think and enjoy my memories. Thank you! I have been using for a year. Upload thousands of picture. It took awhile but they are all there. I like the daily pictures they send to me. The. Best. Picture. Reminder. App. For iOS. Love having flashes from the past pop up!! This is a great app keeps all my photos. I love this app, the only thing I’m having issues with is just now since upgrading to the iPhone 8 & when I try to attempt to open the app it shuts down immediately. Any help?! 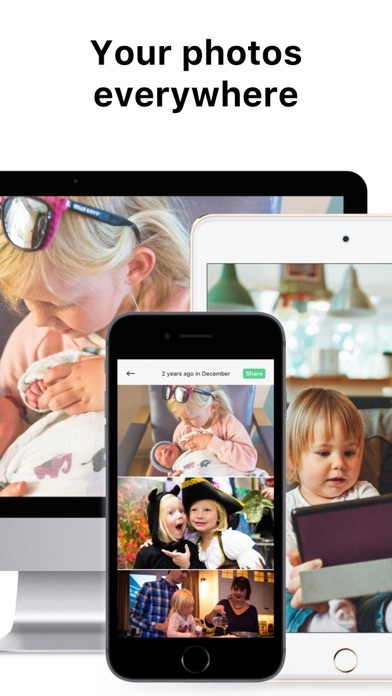 Photo Cloud Storage with so many great features, a daily memory email to remind you of a memory on that specific day, the functionality, practicality and features of this app make it a must. 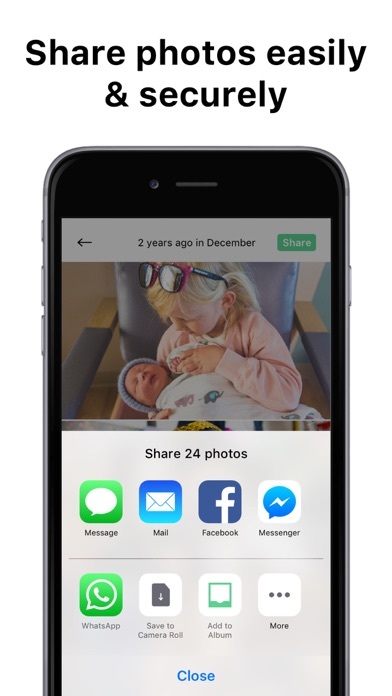 Plus you can share stored photos to social media. It backs up automatically and is a true gem in the land of photo storage apps and cloud storage. Highly Recommend This App! I love it the only problem I have with it is that my pictures won’t leave from my iCloud. But this app is amazing I have pictures that I love and Shoebox helped me keep them safe. I can log in to shoebox on my laptop and sync photos also. You should get this app. This is such a great app. The free photo storage might be the most valuable feature; but, if you opt in for the daily "what happened on this day in history" feature, you'll get a daily email with photos from the past. So much fun and always brings back memories. Love it, and it’s a great space saver. I was upset timeline was not loading. Customer service rep responded with in an hour to let me know there was an error on their end and it’s being resolved. Reassured me all my pictures/videos are safely stored. Great app. Happy user since 2015. That’s about it. I’ve had the paid version for a couple of years now. I also have google photos and amazon prime photos. Amazon prime photos obviously came with my Prime membership so I can’t speak to the free nature of it but the Prime does just as much if not more than Shoebox. And much more smooth. The real winner is Google Photos. For reference, I am an Apple user and fanboy. So liking google isn’t always my first instinct. Google photos does so much more than shoebox in free mode. Much faster and much more simple. More tools to get rid of duplicates and organize. And they are always stored at full res even free. Vids also. And you can store much larger vid sizes....even in the free version. All the features are ready to go out of the box so what you pay for with google is just more space. With shoebox it’s a slow clunky experience. Constantly waiting to load thumbnails. Even on home WiFi with 650MB download speed. It’s an irritating joke. Sometimes it’ll just hang and stop leaving just blank thumbnails. I have to close and reopen the app. Happens quite a bit actually. As far as features go....it’s a pretty mediocre offering. With the paid version all you get is to store you photos at the original res. Yay. Thanks? I would much rather prefer an app that is loaded with features free out of the box and lets you store your photos FULL RES with a storage limit for the free service. And then just pay for more storage. You don’t have to take my review at face value. Go head and try both Google Photos and Shoebox for yourself. You’ll really start noticing the huge differences when you have several thousands of pictures and vids. Shoebox just becomes a chore you kinda wish you had another app for just to make it easier lol. The app is really great and I love using it to save my photos but at the moment it isn’t loading my photos and is not working. Doesn't seem to work anymore. All it does it sync phone pictures! A great way of keeping precious pictures❤️❤️❤️It's part of living. I'm 84 years old, and enjoy it immensely. About 6 years ago I downloaded this app along with a number of other photo apps. I don’t really even remember why I deleted it pretty quickly, but ever since then I randomly get an email titled “This day in history“ from Shoebox containing pictures from my photo library. At first it was a bit annoying since the pictures were recent, but it wasn’t that often so I never opted out. I’m glad I didn’t because now, 5+ years later I get emails with old pictures of my 5 year old daughter (the pictures of her as a baby are way more numerous than they are now, I guess the newness wore off, I’m kidding, she’s my world!) and I usually text a copy to my wife who inevitably sends back an “awww” Anyway, I love this app for that. So, I give an app I haven’t used, or even had, for 5+ years, 5 stars! Thanks for the memories Shoebox!!! Great photo app. 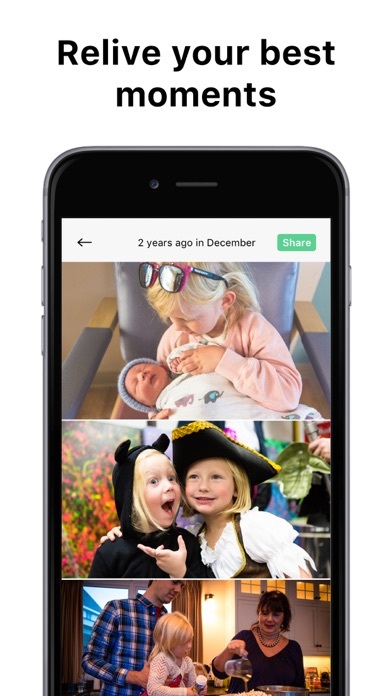 It combines all your photos from others apps & gives you monthly memories! & I LOVE #lastyeartoday memories!! but not perfect yet. After getting a new phone, it seems to be downloading a lot more pictures than I have. The total pictures downloaded exceeds the total pictures on my phone. I have yet to look on my desktop to see if any have been doubled, which is what it sounds like it did. I also wish that once pictures are put “in an album”, that they would just move that picture to the album or checkmark them so we know which ones have been moved. Need a better way of organizing. Another con is that it slowly downloads pictures that have been moved to the cloud, even after disabling optimization. So I have a great amount (about 17,000) that have yet to be transferred to Shoebox yet. I still love the app, but just hope these features would be better! I love that you can search on timeline by year so easy to find photos. The quality is very good. My phone was stolen and I was heartbroken to think I have lost all my pictures. So many memories, so many beautiful pictures of family , family, trips... However, my thoughtful daughter had created an account on ICloud for me, and what wasn’t my joy when I was to recover all my pictures. I could hardly believe my eyes! I’m so thankful for you. Love the updates and memories!!! I am a photo hoarder and I always eat up the memory on my phone with photos. When I got my new phone, the AT&T guy suggested google photos but I didn’t like that app, so I stumbled across this one and I gave it a try. I LOVE this app. I was able to free up most of my memory on my phone, but still have easy access to my photos. They also organize them according to dates and will send you photo memories from previous years. Love it!! All the photos I take are instantly saved!! What could be better than that? I loooved this app. I joined in 2015 and used it so often. It saved my photos and videos perfectly, I even successfully backed them up onto a hard drive. About 2 months ago- all of my photos disappeared. I tried contacting customer service about 4 different times. At first, Brenda acknowledged my inquiry, but never further assisted me. After 3 other attempts, no one responded or tried to help. Now today by some miracle bringing it up in conversation, I went to show someone the issue I'm having on the app, and all my photos were back. Im so thankful that they are, however i would've loved some decent assistance as there was sensitive material that would have been missing. I’ve been using this app since December 2015. I love this app I’ve had a lot of new phones since and it manages to save all my photos! I just have a question, is there any way I can save the photo and have the original date of when the photo was taken on my camera roll? I save photos on my camera roll sometimes, I saved a photo recently to my camera roll and it showed the exact date of when I took the picture and I really like that, but that was the only time it did that. I’ve saved photos to my phone occasionally and the original date only popped up on one photo, I would really like it if all my photos had the original dates on my camera roll. Can you help? It's a great app for your photos!! 100 % recommended! Note first time used apple 2014 ... 6 yrs ago downloading will not me. I have not use app’s application or apple device, the first time early in 2014, the could be others I has identity thefts during in ( 2012 March ) might be impersonation. NOTE: 2012 my personal WiFi network THUNDER WEB been stolen loosed for ever. YOU DID NOT DISCLOSE AT THE BEGINNING OF THE APP. THAT AFTER A FREE TRIAL,YOU GOING TO START CHARGING A CERTAIN AMOUNT OF $$$$,THAT IT IS SO SAD!!! Best app to keep all your pictures handy! True google copied most everything in this app, but it's still free (with a megapixel max that downscales - but my 5MP camera is under that limit so for many people this might be the perfect backup software). Pros: Retains and if you pay the small fee unlimited saved pics and size unmodified is a better deal then googles unmodified option - and unless you have a new high end camera theres no need to pay anything. Also retains all photo details which is great Cons: Like newer ios versions they removed the geographical (google-maps like) zoomable view with auto grouping nearby photos by zoom amount and proximity. I loved that view mode much more then this town/state/country header groups they both switched to. Extra: - If I could ask for anything it would be server side high-end video HEVC re-encoding (Divx?) be available and commenting for shared photo albums. I love, Love, LOVE shoebox. 4 phones later, and I have access to ALL OF MY PHOTOS. I recommend this site to all my friends and family. Keep up the awesome job. Why was I paying $.99 a month to apple for the same service I’m getting from these guys for free? That was a no brainer! Bye bye Apple & hello sweet Shoebox! I absolutely LOVE Shoebox. I love the storage, organization and notices by email of pictures taken. I tell everyone about this wonderful app. My husband has Shoebox as well. Thank you. I love this app. It is so reassuring to know that your photos are being stored and saved ! I don’t know about you but I don’t like losing my data when I lose my phone or my iPad. This is a great way to recover your data! I’m not a computer but expert I don’t know much about them at all. But I can use this program. Simply it’s a very simple way you have a place to go get your data again! I discovered the iPhones don’t talk to each other. Or at least I can’t get them to work. So I upload what I wore and then I can go get it with another computer or iPad or whatever! Thanks to you, shoebox, I HAVE pictures that were gone forever on my new phone. The transferring of my photos from old phone to new phone was not a good thing as I had not backed them up recently. Not good!!! But thank you SHOEBOX. You saved my very important pictures. Get this app if you have a lot of pics. I do not leave reviews under most circumstances, however, I would be remiss if I don’t give credit where it’s due. Shoebox deserves this credit! I reviewed their website and reviews and found that they are reliable! After the pictures are backed into shoebox are you able to delete them off your phone and still be able to see them? Forever grateful to Shoebox. Lost all my backups when I got a new phone, but I was still able to have my memories and life basically saved for me in here. Love it! I don't like that it automatically downloaded ALL my pictures in my phone. I was hoping that I could select the pics to add to shoebox. A fantastic app to remind yourself of time gone bye ! I highly recommend Shoebox. This is absolutely one of my most favorite apps? Why? A few times changing phones or resetting my phone and losing pictures on my device was not a problem. I simply downloaded Shoebox again and logged in, and all of my photos are always there. Shoebox, this app has always been a great part of my photo experience. Could it improve? Why of course. But in the present moment it’s great app! LOVE this app, do wish that videos could upload over cellular...but then I’m just glad you’ve added videos...I’ve used your device for at least 5yrs, have been PRO subscriber for just over 4yrs. While I wish you had more features such as google photos has, including editing ability in app...for the price, reliability, and quality I can’t complain. One issue I’ve had with my other cloud storages is that they don’t export the exif info including date and location, which leads to not knowing the info when in uploads into cloud storages. I’m so glad this info downloads with shoebox which is one reason I continue to keep shoebox. Not only is it the FIRST cloud storage I’ve used, it’s also inexpensive than others. I like the flat rate of $4.99/1hr of Video uploaded and it’s paid for as you need it. I also like that uploads are unlimited. I currently have 850K+ photos & 15K+ videos uploaded. So for around $60/yr for full resolution photos + $4.99/1hr you add as you need it for videos, it is well worth it about 50% less than other cloud storages annually. I’d rate it 4.5stars. Reason for 1 star rating, out of blue, and a week after my latest iPhone 7+ update. App won’t upload photos. It states to go to settings to provide permission. I’ve looked several places and can’t find to where I can grant permission. App’s last update was 3weeks ago...iPhone update 1week ago...so what gives? One star cause what good is a photo cloud app if you can’t upload photos? I love this app! I have all my pictures in one area so I don’t have to search in a million apps! I have broken my phone several times and to know they are backed has made me so happy for all the special moments. I have been using this app for years now and all of a sudden, it takes forever and a day to view old photos. I tried to go back a year ago and all I get are gray boxes and they never show, even on WiFi! Quite irritating to me. It use to be really nice but I don’t know what happened. I even deleted photos. So easy and reliable... a friend recommended it as I kept getting notices saying my memory was full! Broke my screen and had to get it fixed when I got it back it was completely locked so I had to reset my phone which has not been backed up in months because 5gb ain’t shiii,, anyways I’ve had this app for that long and it backed up allllll of my photos in the background without ever really draining battery or straining the phone. Plus unlimited?? Shoebox is definitely a fun app. I signed up with Shoebox as a way of having a backup for my photos. Well, I got more than I expected. Not only are my photos saved, Shoebox sends me a one-page set of pics from a year ago or even older than that (taken the same day as the current day). It is so fun to see my granddaughter, who is 5, as she looked 2 or 3 years ago. Sometimes they even throw in pics older than that. They send one big pic along with 3 other pics from the same day. I keep a lot of them. You’ll love looking at old pics and you can trust them to take care of what’s precious to you - pics you HAVE to keep. My iPad was lost. I thought I had lost all of my pictures. Then I remembered Shoebox. I checked and all of them were saved. I love Shoebox. Thank You! Just now downloaded a few days ago. Really like it. Saved my storage without me having to delete photos. I have told several friends. Love the timeline as it helps me locate pictures quickly. A great app!! I am confident I will be able to retrieve any picture I save in Shoebox. Pros- I like the fact it comes with free unlimited photo storage, and some limited video storage. This app is always being updated, and offers a desktop download for saving photos on your computer. Photos on the app do not count towards phone storage on iOS devices. Cons-Since the recent update, I now have duplicate photos. The paid version is not worth getting unless it included an option to have unlimited video storage. No way to include photos anywhere except from Facebook. I have been using this app for a long time now, but it shows one year of use. I love that it backs up my photos but more than that I love the random emails with throwbacks to years before. I so love to get the these emails with pictures from the past. Some make me smile or laugh and some make me cry but it is so much fun to see them. It's cool since I forgot I had all these pictures , it was nice to find all these memories ! Whenever I have something of sentimental value, I store it away in a shoebox for later nostalgia. This app is like that, but you can only put pictures in it. Still, it's super clean. Love that it saves all my important memories! Backed up my photos and helped save storage! One of my favorite apps. When it comes up l feel great. A lot of these pictures I forgot about. They perk up my day and Mae me deal happy. Thank you shoe box your the best.😊. Bill Brassington jr.
Nice app. But I don't want to auto save my entire camera roll. Wish there was an option to just select the photos you want to backup. Also Multi-Factor authentication would be great. Stores ALL my pictures for free. I love Shoebox! Great app to store all my photos from our iPhones & Nikon camera. I have over 12,000 pictures on my app. I also enjoy the reminder message showing pictures of the past. The customer support is excellent also. Thank you, Shoebox! If You Want To Save Pictures & Delete Them In Your Camera Roll For More Storage This Is The Best App For That. I Absolutely Love This App. What’s so great? It automatically updates from your photos. You take the pics within 24 hrs they are in your shoebox. Need it faster. Open app and update. Delete from photos to get more room. Delete all your photos. No worry. They are still in your shoebox till YOU delete from there. Make sure you update shoebox to insure pics are there. Mistakes happen. Love the uninterrupted storage, don’t have to worry about my photos !! I like to go back and see my photos. Great app. A must have. I love the ease of use for this old senior! I have loved this app until one of the last updates. My app is no longer loading any photos. I am still getting emails with photos from my timeline, but I can’t open any of the photos. Please fix!! This is the best App ever, my favorite and I tell everyone! Wonderful way, without any fuss or "techie" stuff, to store and easily see our photos. Thanks. Amazing, pulls my Facebook photos and all!!! Ace backup, thanks so much for this. I just got an iPhone. This app doesn’t mind. It works great on Android and Apple! It is great! Uploads my photos on its own, if I set it that way, or it can upload while charging, it’s up to me! Fantastic! Thank you, Shoebox App!!! I would like to be able to edit pics and that has never been addressed over the years. I want to fix pics that for some reason load sideways as well as fix red eye and crop. There isn’t an option on desktop version either. Please fix. I've been using this for years and love it!! Wonderful service ! love it! I love Shoebox because it keeps all of my photos arranged in order so that I can find at any time! Thanks, Shoebox! Easy to use app. A comfort to know my photos are backed. Free version has amble space. Highly recommend. Crashes every time I'm on the all for more than five minutes.. Really annoying. All photos in explore show up black. I have had this app. About 3 years I love being able to save my pictures on this app. freeing up space my phone. Love it! It saves pictures with date it was taken and keeps them in order by dates and by year. Give it a try like I did. Pretty sure you will like it too ! I completely love this app I had gotten a virus on my computer and this app helped me recover all my memories I Love ❤️ it !!!! Don’t hesitate. Shoebox is a great cloud. Trust me. I love all my photos being in one place! Memories are never far away or lost! Podemos confiar no Shoebox! Sem duvidas o melhor gerenciador de backups de fotos!! É sempre bom rever os momentos e lembranças com o passar do tempo! Recomendo! Todas as fotos estão lá sempre que precisar!! Teste você também, você vai gostar! In shoebox we can trust!! The best backup photo manager!!! It’s always a good think remember old photos with shoebox! Try it! You will love it!! I love how organized this app keeps my pictures & videos. I am not super tech-savvy. I have kept all my kids’ pictures on my phone for years. I was afraid to delete them, but I didn’t want to have 100 photo albums on Facebook either. The cloud confuses me (again, not tech-savvy) and I have yet to figure it out. Slowly but surely, my phone has run out of storage space. I found Shoebox and it has been incredible! It’s user friendly - even dummies like me can figure it out. It’s easy to understand. It’s so efficient! I’m extremely happy with Shoebox! I recommend it to all of my friends. I was introduced to this app by some random girl I was chatting to online. I was complaining that I always lose all my iPhone photos when I get a new phone because I refuse to pay for Apple’s gimmicky “iCloud” service. She recommended I download Shoebox, and app she personally uses to solve the problem of losing photos. I downloaded, seamlessly uploaded all of my photos and videos to Shoebox’s servers, and immediately got out all my old iPhones too upload all my photos from them too! Finally, I can view and download all my old photos on my new iPhone easily! This is great :) I chose to use the secure iCloud password, which is very hard to remember, so I recommend keeping your password somewhere you can remember Incase you break your iPhone and can no longer access your iCloud Keychain to put your difficult to remember password in! Great for downloading and saving photos from my Apple devices. Brenda from Shoebox provides great support. Helped me download photos quicker on my Apple devices. Great technical support. Great app love it so much. All of my photos were downgraded to low res because my automatic payment failed. My credit card company sends me a new card with a new number practically every 9 months. I get way too many emails to see or deal with this in time, so I miss the short deadline and lose all of my high res backups. I would happily have paid retroactively for the lost weeks even with a penalty if it would have meant keeping my high res photos, but since their business model is to immediately downgrade & delete high res copies, I’m out of luck They have lost a paying customer because of this. Gave up my paid cloud and Shoebox keeps all my shots. Yippie! What I especially love about this app is the fact that everyday I’ll get a notification of what i was doing at this time last year, two years ago, etc. and it just takes me back. Unlimited high quality photo backup is so good and if you want original resolution then and only then do you have to pay. Great alternative to iCloud and Google Photos that is also better than both of them. Won't load pictures past a certain date when viewing photos through the timeline on both the phone app and desktop. I use this app often! I really like being able to review photographs that would otherwise be long since forgotten! Shoe Box is Jewel Box ! Mini story(how this app saved my life) My iPhone 5s stopped working and nothing was backed up onto my iCloud. I was scared I had lost all my photos, forget the selfies I had my family photos/videos. i has forgotten I had downloaded this app years prior. I logged into my account on my laptop & boom every single photo/video on my iphone5s was automatically saved onto my app. Thank you shoebox app!! I didn't know I would have to pay for a plan. I am happy to have a place to store my photos! Thanks for this app. However, I’m not seeing the things others are on all of my devices, such as how to upload only a couple of pics at a time, and right now, I have multiple pics because it uploaded my old phone pics and new ones (many were the same). I am trying to delete them but nothing is happening on my iPhone X! Please keep updating the app so it works well with the newer versions of the various phones and tablets. I hope I can keep using it for my photos. I do not understand what the difference is between the free and the pro versions. But I am getting a ton of emails telling me to “choose a plan” or it will stay on the free plan. I get tons of emails though I’ve changed my settings. It’s intrusive. Otherwise, I do like the app so far. This Day in History-LOVE it! Shoebox does a great job reminding me of all the photos I took on a certain day in history. A great reminder for me to take more photos and document my life for future retrospectives. Love this app! It has helped me save on storage space on my phone & tablet. I can easily access this app anytime and download good versions of my photos whenever I need to share them with family or to temporarily load them back on to my phone to make prints at a photo store.